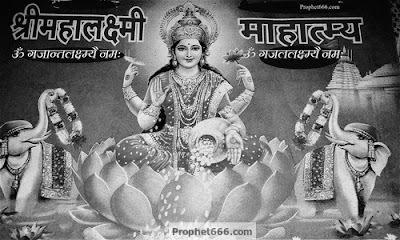 The worship of Gajant-Vaibhav Lakshmi, Gagalaxmi or simply Vaibhav Lakshmi can prove to be most beneficial for everyone, including shopkeepers, traders, industrialists and other business-persons, in removing business-hurdles, debts and attract growth, money and abundance into their business. The Vaibhav Lakshmi Vrat can also be kept by individuals, who are not business-person to fulfill any long cherished hope, wish or desire. Gajant-Lakshmi is that form of Lakshmi in, which she is seated on a Lotus flower and is flanked by a pair of elephants with their trunks elevated and showering water on her or holding garlands. The Gajant Vaibhav Lakshmi Vrat or fasting to appease the Goddess Laxmi is one of the most popular fasts in the Hindu religion. It is mostly Suhagan or married ladies who are advised to perform the Gajant Vaibhav Lakshmi Vart by taking a Sankalp[pledge] to perform the Vrat for a fixed number of Fridays without taking a break. The only exception is for women who are having their monthly cycles. Small booklets on how to perform this Vrat are available in most Indian languages in every nook and corner of India. The details and complete procedure and the rules to be followed are given in simple language in these booklets. There might be slight variations, here and there, in the rituals, depending upon the traditions and customs prevalent in some parts of India. The name of the Vrat can also be different and in some places it is simply known as Mahalakshmi or Lakshmi Vrat, however, devotees need not ponder upon this and remember that the end goal of the Vrat is to appease the Wealth Goddess in any form. While taking the Sankalp, the devotee should pray to the Goddess that her/his desired wish be fulfilled, after that there is no need to keep repeating or thinking about that wish all the time, while keeping the Vrat. The Gajant-Vaibhav Lakshmi Vrat is kept by devotees for a wide and diverse range of purposes, including marriage, child, health, money, personal and business growth and freedom from debts. Those, who are unable to undertake the Vaibhav Laxmi Vrat can simply worship Gajant Vaibhav Laxmi by keeping her photo in their homes or offices. Keeping a photo of Gajalakshmi in a shop or office is considered to be most auspicious in attracting positivity and auspiciousness in matters of money and finance. The photo of Gajant Vaibhav Laxmi can also be installed above the safe, money locker or cupboard or even the cash counter. There is no need to engage in any elaborate ritual or any other form of worship, keeping the photo clean and lighting an Agarbatti in-front of it in the mornings, after opening the shop or office and in the evenings at dusk-time is sufficient. It is advisable to offer a Prasad of Sweets on Tuesdays and Fridays.